Achieve optimum throughput in Cassandra today with these useful tips. My previous post on this subject has proven extraordinarily popular and I get commentary on it all the time... most of it quite good. It has, however, gotten a decent number of comments from people quibbling with the nuance of the post and pointing out its failings, which is fair because I didn’t explicitly spell this out as a "framework of thinking" blog post or a series of principles to consider. This is the tension between making something approachable and understandable to the new user, but still technically correct for the advanced one. Because of where Cassandra was at the time and the user base I was encountering day to day, I took the approach of simplification for the sake of understanding. However, now I think is a good time to write this up with all the complexity and detail of a production implementation and the tradeoffs to consider. Find the ideal write size it can make a 10x difference in perf (10k-100k is common). Limit threads in flight when writing. Use tokenaware unlogged batches if you need to get to your ideal size. Details on all this below. 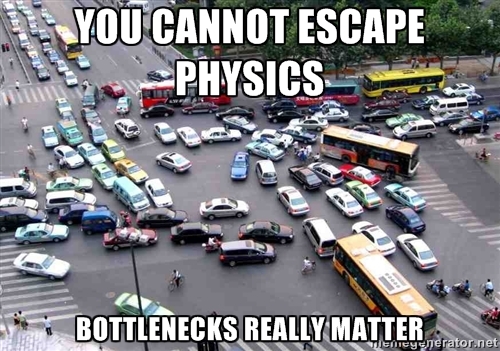 Okay, it’s not really physics, but it’s a good word to use to get people to understand you have to consider your hard constraints and that wishing them away or pretending they’re not there will not save you from their factual nature. So now, let's talk about some of the constraints that will influence your optimum throughput strategy. Now that the clarification is out of the way. Something the previous batch post neglected to mention was the size of your writes can change these tradeoffs a lot, back in 2.0 I worked with Brian Hess of DataStax on figuring this out in detail (he did most of the work, I took most of the credit). And what we found with the hardware we had at the time was total THROUGHPUT in megabytes changed by an order of magnitude depending on the size of each write. So in the case of 10mb writes, total throughput plummeted to an embarrassing slow level nearly 10x. Using the same benchmarks tiny writes still managed to hurt a lot and 1k writes were 9x less throughput than 10–100k writes. This number will vary depending on A LOT of factors in your cluster but it tells you the type of things you should be looking at if you’re wanting to optimize throughput. 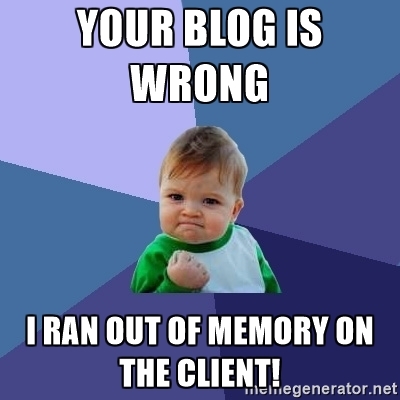 Can your network handle 100 of your 100mb writes? Can your disk? Can your memory? Can your client? Pay attention to whatever gets pegged during load and that should drive the size of your writes and your strategy for using unlogged batches or not. I’m dovetailing here with the previous statement a bit and starting with something inflammatory to get your attention. But, this is often the metric I see people use and it’s at best accidentally accurate. 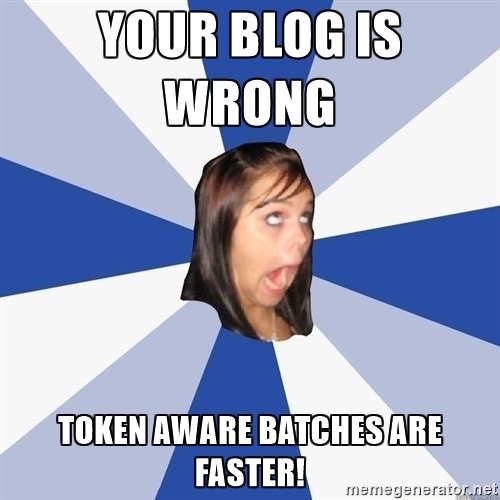 I’ve had some very smart people tell me "100 row unlogged batches that are token aware are the best." Are those 100 rows all 1GB a piece? Or are they all 1 byte a piece? I had many people smarter than I tell me “my post was wrong” because they were getting awesome performance by ignoring it. None of this is surprising. In some of those cases they were still missing the key component of what matters, in other cases rightly poking holes in the lack of nuance in my previous blog post on this subject (I never clarified it was intentionally simplistic). 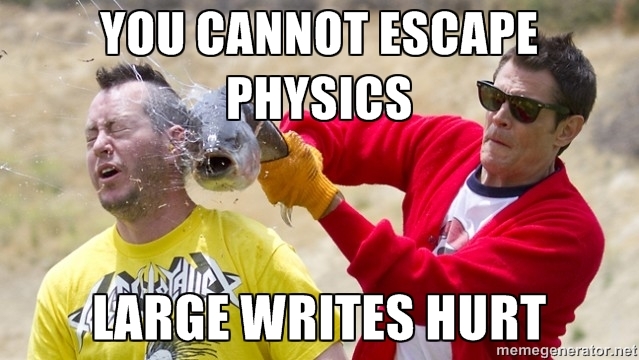 I intentionally left out code to limit threads in flight. Many people new to Cassandra are often new to distributed programming and consequentially multi-threaded programming. I was in this world myself for a long time. Your database, your web framework and all of your client code do everything they can to hide threads from you and often will give you nice fat thread safe objects to work with. Not everyone in computer science has the same background and experience, and the folks in traditional batch jobs programming which is common in insurance and finance where I started do not have the same experience as folks working with distributed real-time systems. //placeholder: put any logging or on success logic here. //go ahead and wrap in a runtime exception for this case, but you can do logging or start counting errors. Either approach works as well as the other. Your preference should fit your background. Sure tokenaware unlogged batches that act like big writes, and really match up with my advice on unlogged batches and partition keys. If you can find a way to have all of your batch writes go to the correct node and use a routing key to do so, then yes, of course, one can get some nice performance boosts. If you are lucky enough to make it work well, trust that you have my blessing. 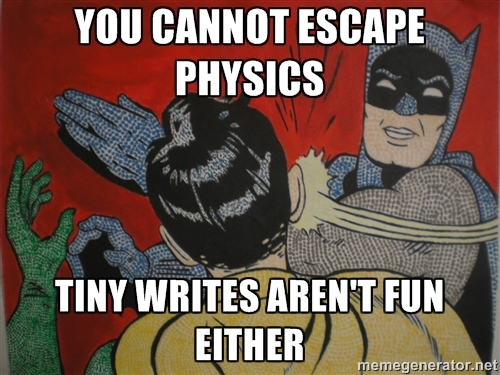 Anyway, it is advanced code and I did not think it appropriate for a beginner level blog post. I will later dedicate an entire blog post just to this. Distributed databases often require you to apply distributed principles to get the best experience out of them. Doing things the way we’re used to may lead to surprising results. Published at DZone with permission of Ryan Svihla , DZone MVB. See the original article here.